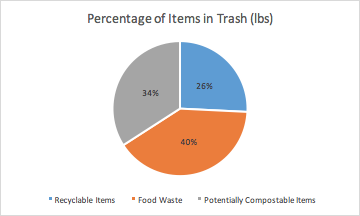 Prior to the 2016 Chapman University Waste Management and Dining Services Audit, the volume of waste being produced at and by on-campus dining options was unknown. 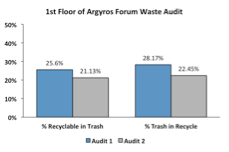 The Main Campus Dining Services chapter fills this knowledge gap with data from waste audits conducted at two high-traffic on-campus eateries: Argyros Forum and Starbucks. 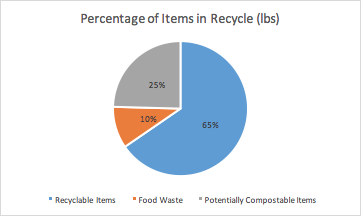 This chapter looks at the volume of disposable post-consumer waste generated at on-campus dining, the impact of education and potential impact of incentive programs on waste reduction behavior, and purchasing options and how more sustainable purchasing options can be made for main campus dining options. For more information, refer to Chapter 5 of the 2016 Environmental Waste Audit, written by Ari Jong, Katherine Whiteman, and Abigail Messmer. 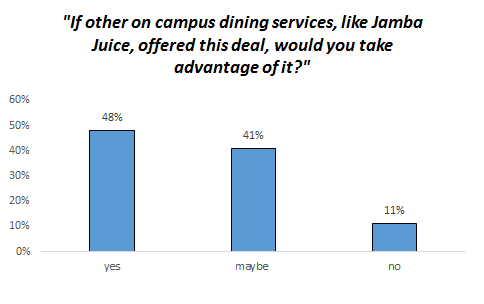 •Switching to new disposable products for all Main-campus dining locations can save Chapman money. •Compostable products include paper cups, plates, bowls, utensils and napkins. 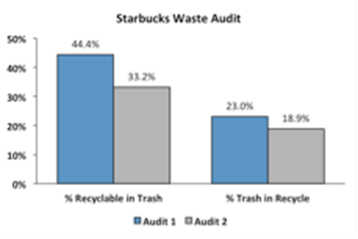 This section of the Main Campus Dining Chapter describes the results of a study that tested the effectiveness of educational waste sorting signage on the proper recycling habits of the Chapman community by conducting waste audits both before and after education signage was posted at on-campus eateries. Figure: The designs of the educational waste sorting signage posted the day following the first waste audit for both locations. 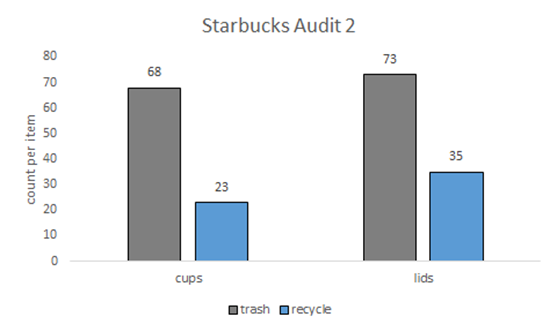 Results from the “before” and “after” waste audits of both the first floor of Argyros Forum and the on-campus Starbucks show that the percentage of improperly disposed of waste items decreased by small proportions, on average 5% and 8% respectively, during the three weeks between the first and second audits. 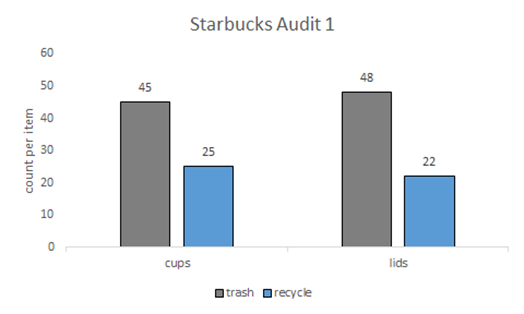 Figure: Percentage of improperly disposed waste items out of total trash or recycling weight.The percentage decreased from Audit 1 to Audit 2 for both locations on campus, but more modestly for the first floor of AF than for Starbucks. This data demonstrates that education alone is not enough to encourage transitions to more sustainable behaviors. 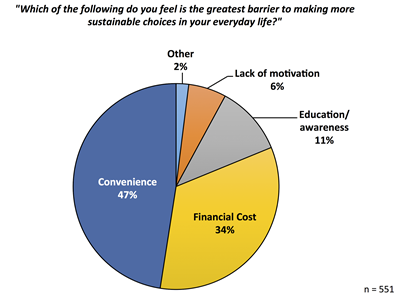 The pie chart indicates that the Chapman community feels that the greatest barriers to increasing sustainable behaviors in their own lives are convenience and financial cost. Figure: Student opinions on sustainable choices. One recommendation would be to implement Starbucks’ reusable tumbler discount at all on-campus dining services.